The romances in Dragon Age 2 are for everyone, says the games lead writer, not just for the straight, male gamer. 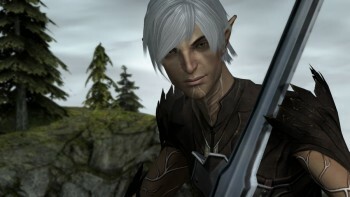 A disgruntled BioWare fan, who accused the studio of neglecting the "straight, male gamer" with the romance options in Dragon Age 2, has received a dressing down from the game's lead writer, David Gaider, who says that while straight, male gamers might be the majority, raw numbers don't give them any right to expect special treatment. The poster was upset that male characters were hitting on him, and suggested that BioWare could easily have included a "No Homosexuality" option. He felt that BioWare had not tried to make appealing romance options for people like him, and that its focus had been on other, less numerous groups like women and homosexuals. Gaider scoffed at this idea however, saying that the romance options in Dragon Age 2 were for everyone, regardless of their gender or sexual orientation, and that no one group was being favored over any other. Gaider also attacked the idea that the poster could speak for straight, male gamers at all, saying that he could certainly present his personal feelings - although Gaider felt they were based on ignorance - but that trying to speak for a whole group was a fool's errand. Gaider said that the poster's attitudes were rooted in a sense of privilege, and that he was so used to getting things his own way, when everything was fair, he perceived it as imbalance. Gaider thought that anyone who said that the only way to please them was to restrict the options of some other group, was - in his view - the least deserving of being accommodated. It's great to see a developer trying to include as many people as possible with its games, even though they might not be the bulk of a games audience. You can read the entire exchange here, and if you've got a few minutes spare, I thoroughly suggest that you do. The original complaint has to be seen to be believed, and Gaider's full response is a joy to read.